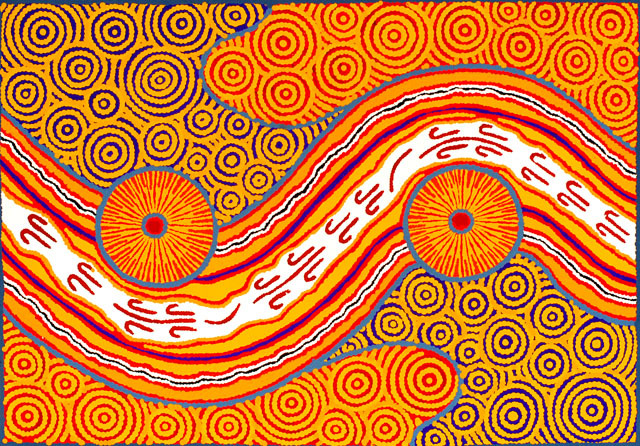 Traditionally, Australian aboriginal people set fires in their landscape to facilitate hunting. 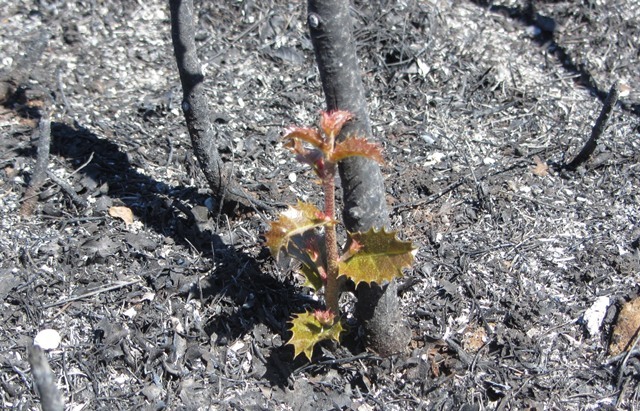 A recent study has compared the landscape and fire history from two regions, one where aboriginal people live in a traditional way and the other where fires are “natural” and caused by lightning . 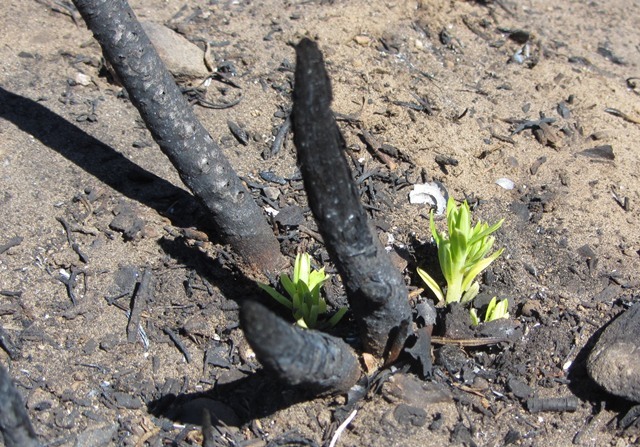 The results show that aborigines generate many small fires that are climate-independent, while lightning generates few large climate-driven fires. 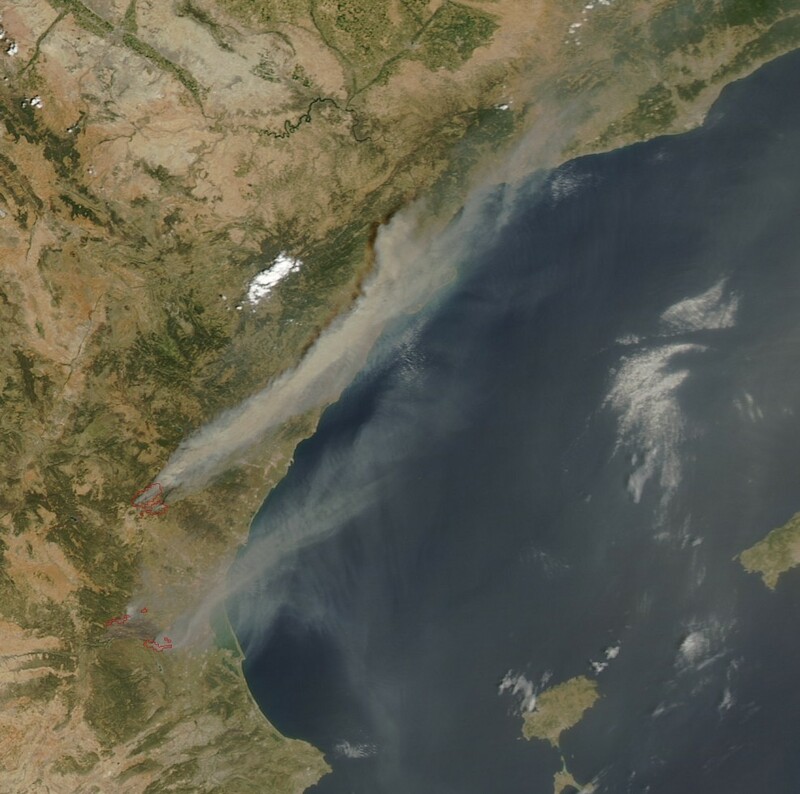 Anthropogenic fires are smaller even when climatic conditions cause huge fire in the lightning region. The authors suggest that this climate-buffering effects of aboriginal fires has likely been important for many species that benefit both from fine-grained mosaics of alternating resources and from enhanced protection from large catastrophic fires and the predators that hunt within them. This may explain the coincident decline of many small- to medium-sized mammals in the arid regions of Australia with the cessation of aboriginal hunting and burning. That is, the extinction of the aboriginal life style shifted fire regimes from small fires to large climate-driven fires, in a similar manner to the extinction of rural life styles in the Mediterranean Europe , and this shift promoted the extinciton of Australian mammals. Few days ago two simultaneously large fires occurred very near to Valencia city : The first affecting Dos Aguas and surroundings (ca. 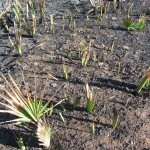 29000 ha burned), and the second in Andilla and surroundings (ca. 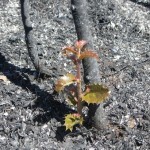 19000 ha burned). 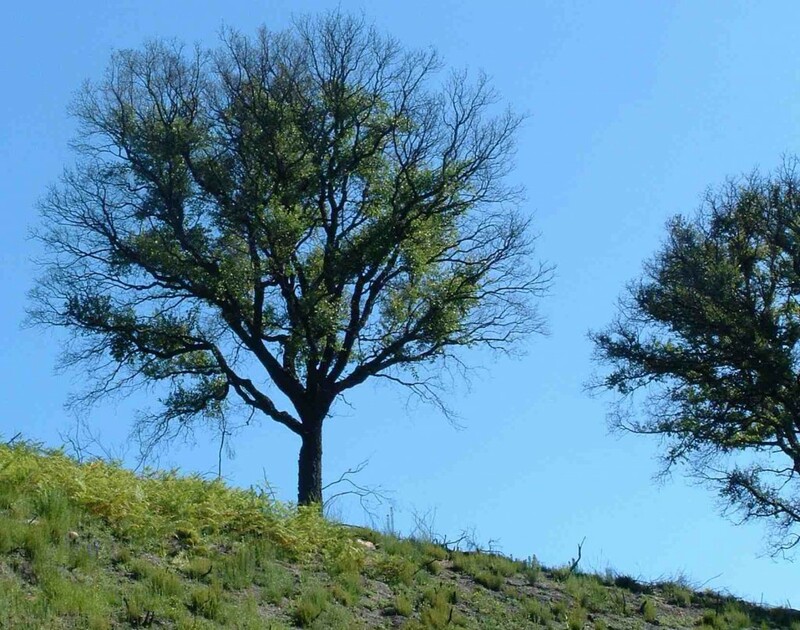 The fires burned under extreme fire whether conditions (strong drought, high temperature and strong dry wind [Foehn type wind]). 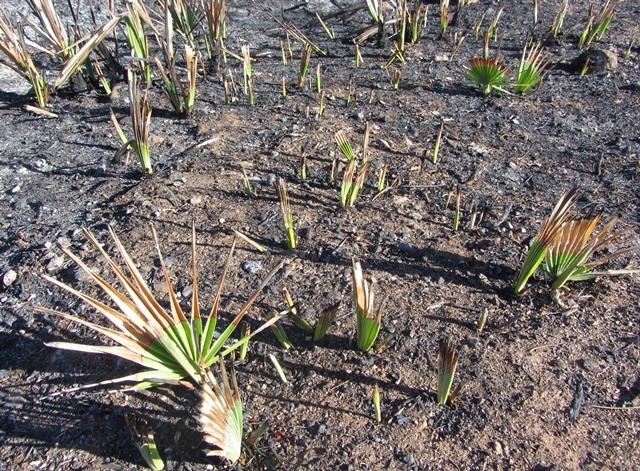 15 days after the fire, I visited area burned around Dos Aguas and took these pictures showing the postfire life activity; several species already started to resprout and pines were dispersing their seeds. 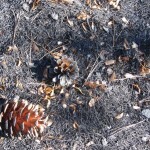 In addition I saw several lizards, different birds and a fox, all in the middle of the recently burned area, quite far from the edge of the fire. C. Resprout of Daphe gnidium (en: flax-leaved daphne, es: torvisco, cat: matapoll). 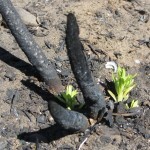 The high intensity of the fire is clear from the thick remaining branch. 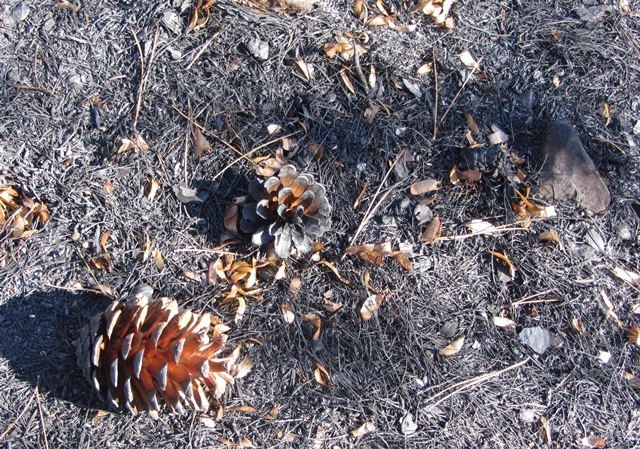 D. Post-fire seed dispersal of the serotinous cones of Pinus halepensis (en: Aleppo Pine , es: pino carrsco; cat: pi blanc). Incendios forestales en Valencia, Junio 2012, jgpausas.blogs.uv.es, 4/Julio/2012.